This editable vector map of France has superb detail on its boundaries, making it look elegant at any scale. The boundaries of the main French regions are included in interlocking layers on the editable Illustrator and SVG files, which means you can colour each region differently if wanted, and hide or show the regions as needed. The three styling examples shown here are included as ready to use PDFs and JPEGs in the download alongside the editable Illustrator and SVG files. Click on the map to the right to pan and zoom through the different examples. 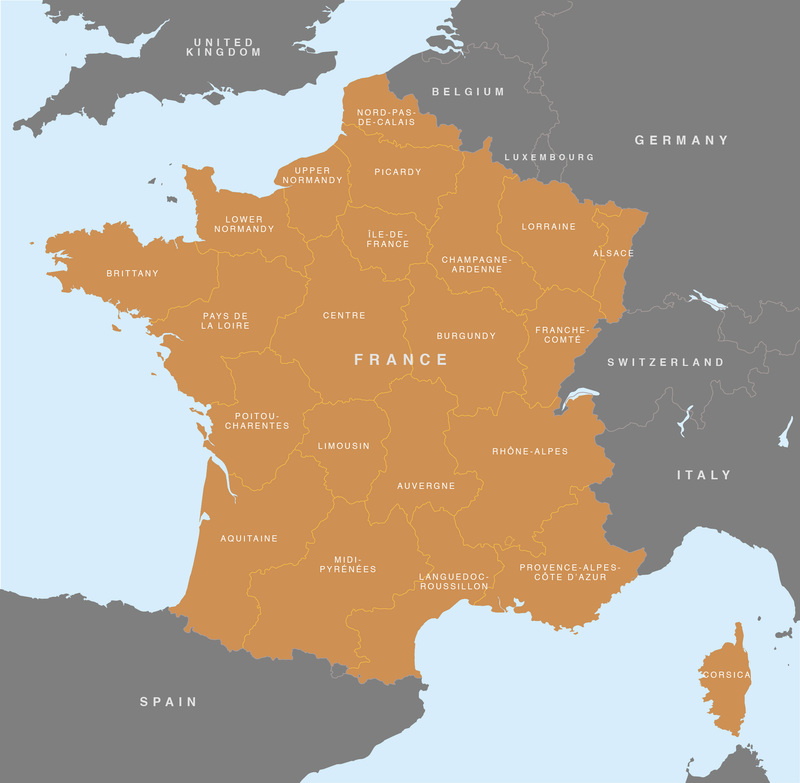 The 22 principal regions of France plotted on the map are Alsace, Aquitaine, Auvergne, Basse-Normandie (Lower Normandy), Bretagne (Brittany), Bourgogne (Burgundy), Centre, Champagne, Corse (Corsica), Franche Comté, Haute-Normandie (Upper Normandy), Île-de-France, Languedoc-Roussillon, Limousin, Lorraine, Midi-Pyrénées, Nord-Pas-de-Calais, Pays de la Loire, Picardie (Picardy), Poitou-Charentes, Provence-Côte-d’Azur, Rhône-Alpes. There are separate label layers on the Illustrator file that let you quickly switch between the French and Anglicised region names.